It’s February and love is in the air. Honestly, I hope love is in the air every month for you. It is for me. February is the month of LOVE, though. I find that I cook, bake, and am generally more crafty during this shortest month of the year. I have several recipes and projects planned for this month that I’ll be sharing, so keep checking back. Before you begin mixing, preheat your oven to 350 and line a baking sheet with parchment paper. In a large mixing bowl add coconut, egg whites, granulated sugar, and vanilla. Mix everything together so that all the coconut is completely coated. 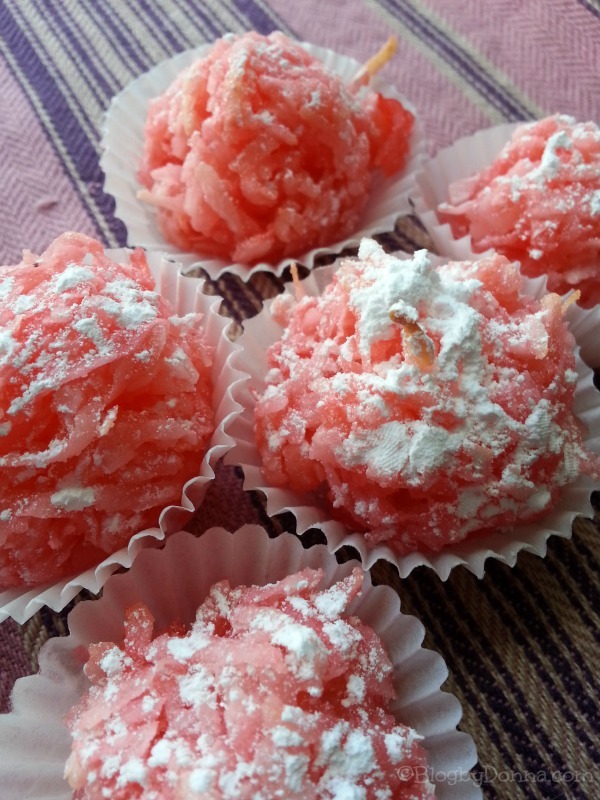 Add one to two drops of red dye, depending on what shade of pink you want them, to the mix and use a metal spoon to get all the coconut coated. Grab your baking sheet and using your hands form truffle sized balls of the mixture. You are going to need to press them together tightly at this point to make sure that they stay in form while baking. Set each macaroon onto the parchment lined paper, an inch apart because even though they will not puff up, they do sweat. Bake 10-12 minutes, until you begin to see some color on the coconut. Remove from the oven and let them cool on the sheet, don’t try moving them now because they will fall apart. Once the macaroon balls are cool they firm up and then you can transfer them into mini cupcake liners for serving. At this point go ahead and lightly dust them with powdered sugar– if you do this while they are cooling the sugar will melt into the balls so wait until they are entirely cooled off. Serve and enjoy! 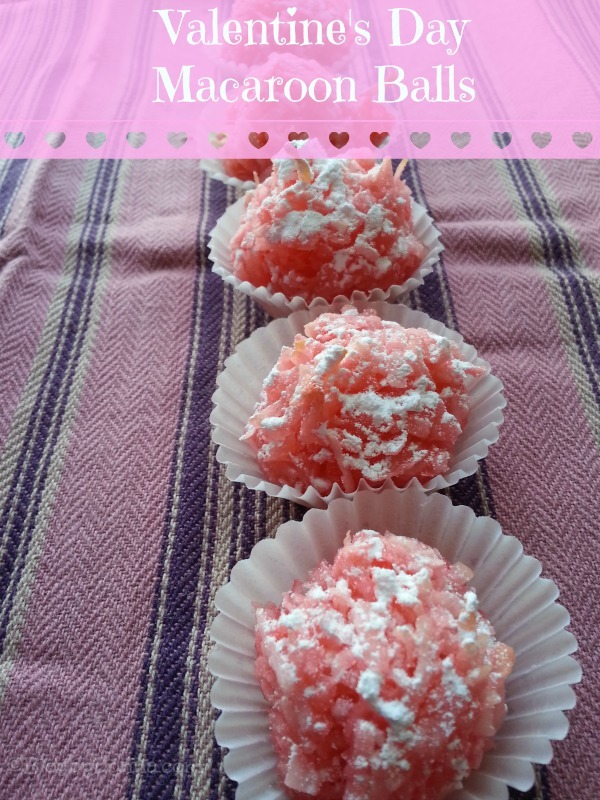 I hope you’ll let me know if you try this Valentine’s Day Macaroon Balls Recipe! What’s your favorite Valentine’s Day dessert? These look really good!! They would be perfect to send in to my daughters Valentine’s Day party! Oh yum! I love coconut. These look so yummy and festive! Those look so good. I love anything that’s coconut! Yummy! Sounds like little hands could help with this one!! I like the way these sound like they taste! Mine will have to be white, though. No can do the red dye around these parts! These look so good, and the perfect color for Valentine’s Day! I have a weakness for chocolate but when I see macaroons, I always grab one. Love them! I LOVE Macaroons so I’m sure I would love your Macaroon Balls! I look forward to trying the recipe! So cute! I didn’t realize these were so easy to make. We’ll have to try them ourselves! Now these macaroon looks amazing! Those are so cute and they look so yummy! I pinned this, it looks great! I love goodies with coconut. These look mmmmmmm! Pinned it! I LOVE macaroons. These are so pretty, perfect for Valentine’s Day. What a cute treat for the holiday! My favorite is chocolate covered strawberries. These look great. I pinned them too! I;m going to have to make these. 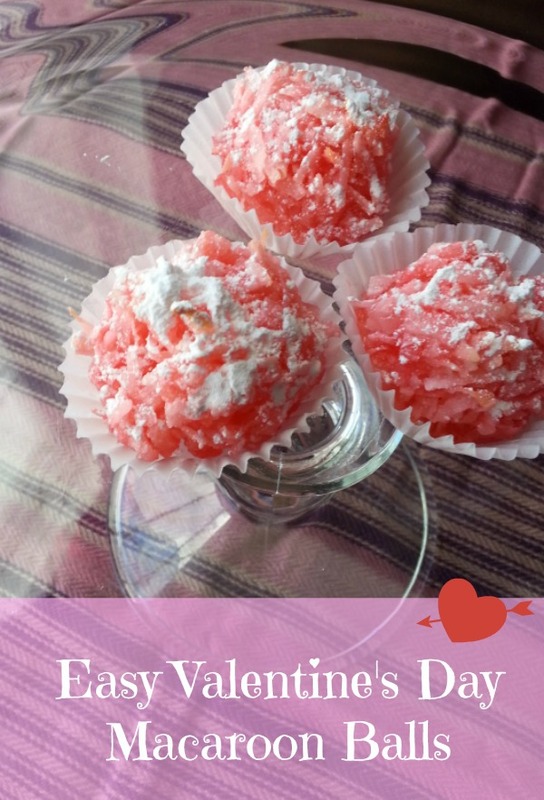 My middle kiddo ADORES coconut … he would love these as a Valentine treat! I love that they are pink. They look sweet and tasty. Yum! These look fantastic! i have never made macaroons before. I love macaroons. This look delicious. I love macaroons! It is one of the few coconut desserts that I really like. I will have to make some of these for our Valentine’s treats! I love macaroons and I love that these are PINK. I want to make some. These are so pretty! I am certain that my family (hubby and two boys) will be mortified that they are pink, but I don’t care! I LOVE them! Thank you for the recipe! I pinned it! Great idea to dye them. I’ve been making macaroons lately but the recipe calls for flour and I’ve been substituting that w/ gluten-free flour. Those are just the most darling little pink cutie pies! I don’t believe I ever tried a macaroon before, but they look good! I’m good with cookies, but these look so pretty! You’re so creative! I would have never thought of making something like this, they look deeeeee’licious! I love macaroons! 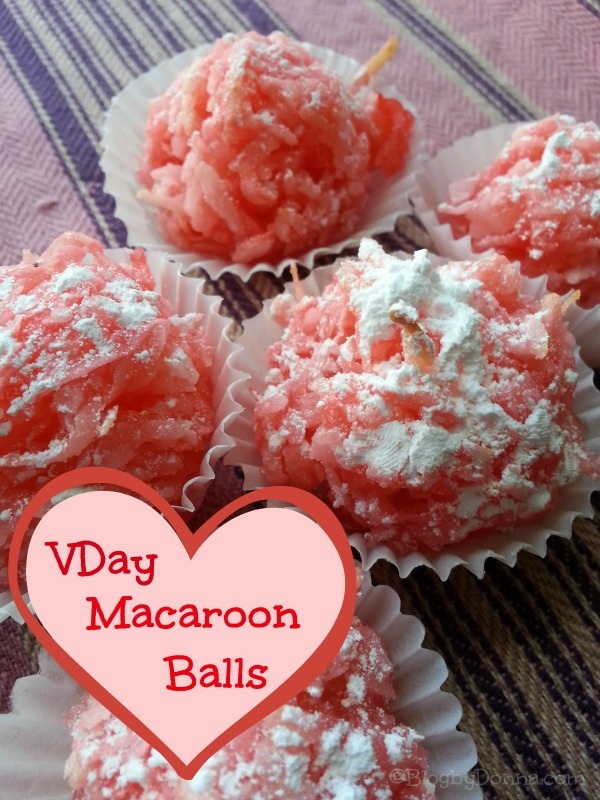 Your Valentine’s Day Macaroon Balls recipe looks delicious and easy to make. Yum! These would be pretty for a birthday party or bridal shower too! Yum! These look so adorable and delicious. I love how easy to make they are, and coconut is one of my favorite flavors. Those look SO good! I love coconut, I can see myself eating way too many of those! These look fantastic! You can’t go wrong with coconut! These look so pretty, thank you for sharing this with us. Those really look tasty. Love that there isn’t a long ingredient list. These look adorable. I’d love to make them for our Valentines date night. Sounds like an interesting recipe.